Each week your child will receive an english, maths and spelling homework on a Friday. This will need to be handed in by the following Friday. We will be testing the children on times tables and spellings every Friday. Please keep practising 3,4 and 8 times tables. Thank you in anticipation for your support. Year 3 had great fun making mud faces and jewellery using natural resources in our outdoor environment. We had a great day exploring and learning at the museum. Year 3 were delighted to be the attendance champions last half term! Well done Year 3 for your fantastic attendance and coming to school everyday ready to learn. 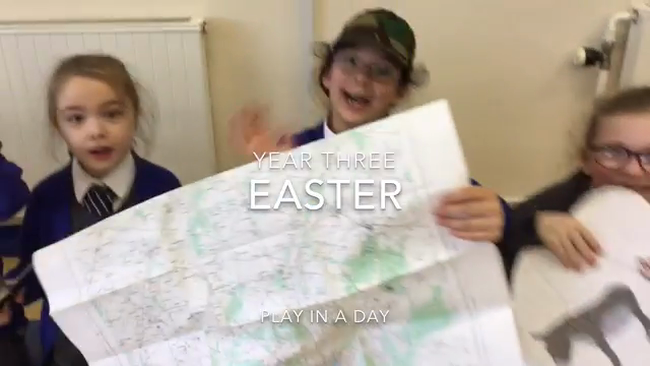 Year 3 had lots of fun acting out the Easter story during a play in a day last week. 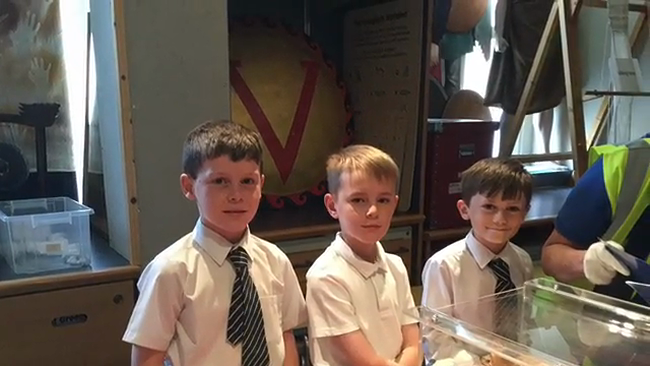 We were very proud of their expression and confidence. Thank you, Natasia. We love sharing ideas and writing. We have been practising using personification in our writing. We are so proud of these four children whose writing has been chosen for publication. Congratulations! It is lovely to see your love and enthusiasm for writing. We loved completing a carousel of activities exploring different everyday concepts through experiments. We had a great day dressing up as our favourite book characters! We loved sharing some of our favourite stories and reading new ones too. We made our own pictures of the Liverpool skyline linked to our topic, Liverpool. Labelling different parts of a flower. Learning all about our families. We have enjoyed converting between measurements and using different measuring tools to compare and order measurements. We learnt all about Islam for World Faith Day. In particular, we found out about fasting during Ramadan and the importance of the Quran. These four boys are very proud of their writing, keep up the fantastic work! We have been looking at mystery stories in English. We are extremely proud of the children's writing and enthusiasm. We acted out a scene from 'The Tunnel' before using inverted commas to write a dialogue. Year 3 enjoyed making fraction walls and experimenting with bar models. We have learnt how many equal parts each fraction has. We are also starting to compare equivalent fractions using our fraction wall and have been finding fractions of a shape. Well done Year 3, a great start to our fraction challenge! We are extremely proud of all of the Children for presenting their talk day homework with such confidence. We were very lucky to have Bible Tales come into our School and perform a play on the Christmas Nativity. Thank you, we loved it! We have been doing lots of creative writing and hot seating. Well done to Oscar and Georgia for thinking carefully about their character in role. We loved sharing our writing with Year 1. It was lovely to hear such great peer support and feedback. Year 3 have been investigating shadows. We found that our shadows change during the day depending on the position of the sun in the sky. Our shadows were shortest at midday when the sun was directly above us! Year 3 had a great day with Altru drama performing a play on The Stone Age. We have been painting and sketching our own Cave paintings linked to our topic The Stone Age. We thoroughly enjoyed learning all about Harvest with Natasia. We explored different Christian values related to Harvest. In particular, we thought about the importance of patience, joy and humility. Year 3 researched the life of Mary Seacole. We were able to understand why she is significant and the impact she had on equality. We shared some of our diary entries with the rest of the School. Well done Year 3 for super writing! We are very proud of year 3 for their super reasoning and place value skills! Well done to our children who have completed the Year 3 time challenge! In Science Year 3 have been identifying different light sources. We used mirrors to experiment how light is reflected from a shiny, smooth surface. We had lots of fun performing and listening to different poems for National Poetry Day. In particular, we enjoyed performing 'London 2012'. Year 3 have been learning how to say their name, age and birthday in French. We have been singing lots of songs and practising our French accents.